Location: Dundrum, County Down, Northern Ireland. Notes: Dundrum Castle is a castle, situated above the town of Dundrum, County Down, Northern Ireland, not to be confused with Dundrum Castle in Dundrum, County Dublin. It was constructed by John de Courcy, sometime near the beginning of the 13th century, following his invasion of Ulster. 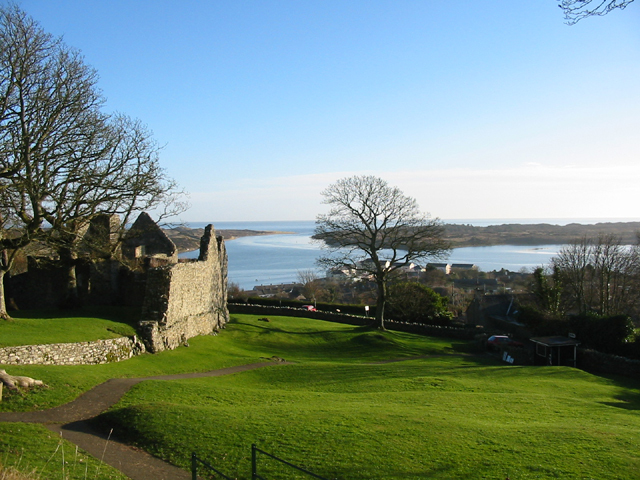 The castle, built to control access into Lecale from the west and south, stands on the top of a rocky hill commanding fine views south over Dundrum Bay and the Mourne Mountains, the lands west towards Slieve Croob and the plains of Lecale to the east. The Castle is a State Care Historic Monument in the townland of Dundrum, in Down District Council area, at grid ref: J4047 3700.